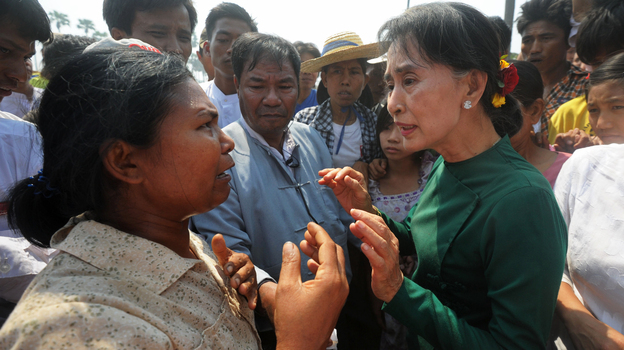 “Burma has a long and tortured history,” wrote Sherry O’Keefe in Champion of Freedom: Aung San Suu Kyi. Much has changed in Burma (also known as Myanmar) over the course of the last century. It has been ruled by the British, then the Japanese, then it was taken over by General Ne Win and his military regime in 1962. All the while, the people of Burma have fought tooth and nail for democracy, and they have suffered for their efforts. They [the SLORC] apprehended the most loyal and able NLD supporters, usually students, and either imprisoned them or forced them to serve in ongoing wars against insurgent forces. While waiting to be shipped off to battlefronts, many students were subject to cruel forms of punishment, such as being stripped naked and herded around like animals. Others were brought to mine fields and forced to walk across them as human minesweepers. This past weekend, Burma and the rest of the world witnessed what seems to be democracy gaining another inch. Aung San Suu Kyi, beloved freedom-fighter and leader of the National League for Democracy, was, for the first time, allowed to openly move around the country campaigning for her party and its mission. Elections to Parliament are set to take place on April 1 of this year.